In 1991 the Department of Energy (DOE) brought together a “tiger team” to gather environmental documentation on the historic and current research operations of the Lawrence Berkeley National Laboratory. This review was driven by the passage of the Resource Conservation and Recovery Act (RCRA). The initial investigation uncovered numerous violations at LBNL and raised serious questions over the lab’s environmental management. Within the next decade, community concerns over waste management and radiation emissions resulted in one lawsuit and the eventual closure of the National Tritium Labeling Facility at LBNL. There is little question that the RCRA investigation also facilitated the closure of the Bevatron in 1993. 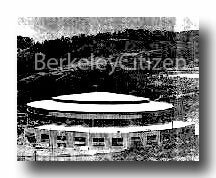 First steps in addressing a decade of community questions over the health and environmental impacts from the LBNL were taken in 2001 when the City of Berkeley hired independent contractor, Bernd Franke of IFEU (Institut fur Energie-und Umweltforschung). The IFEU evaluation “Review of Radiological Monitoring at LBNL” was released in August of 2001. Below is part of that report. L A Wood And Carolyn Erbele. Certainly the most significant conclusion(s) to be drawn from this limited review of environmental documents concerned the operations of the Bevatron complex and particle accelerator. IFEU determined that historic radiation doses, measured at LBNL's Olympus Gate (ENV-B13D) Direct Radiation Monitoring, Station, had exceeded the then allowed annual dose (500 mrem/y) by nearly 60%. (Note: The dose reported at Olympus Gate was calculated to be about 800 mrem/y. It should also be noted that Olympus Gate Monitoring Station is located just a few meters below a offsite residence at the intersection of Olympus Avenue and Wilson Circle. LBNL's 1996 Site Environmental Report shows the location of radiation monitor ENV-B13D) Berkeley Citizen. C.1 What exposures to neutron and gamma radiation resulted from LBNL operations? At early times neutron exposures of employees (as well as possible offsite exposures) were significant. Professor E. 0. Lawrence himself requested that the Physiology Dept. at U. C. Berkeley look into the possible harmful effects of neutrons after finding the at the building which housed one of his cyclotrons had become activated by neutrons. Lawrence et al began construction of the 184 Inch Synchrocyclotron in 1940, the magnet of which was used in his "Calutron" experiments to enrich uranium for use in atomic bomb research. This site was on the "hill", and separate from his earlier cyclotron research on the Berkeley Campus proper. The hill site became the Lawrence Berkeley Laboratory. The accelerators at Lawrence's labs were used primarily for research in high-energy physics, but also for radiation biology, medical research, atomic physics, heavy radionuclide production and research (Heilbron (1981)), and very high intensity photon sources. The Atomic Energy Commission (AEC), followed by the Energy Research and Development Administration (ERDA), and then the Department of Energy (DOE) maintained regulatory statutes for public protection against radiation-related injury. The AEC protection limits were first established in the 1940s. Later, AEC Manual Chapter 0524 became the reference. The DOE retained Chapter 0524 until 10CFR835 came into effect. The calculation and/or measurement of radiation doses are called dosimetry. The International Commission on Radiological Protection (ICRP), the National Council on Radiation Protection and Measurements (NCRP), and the International Commission on Radiation Units and Measurements (ICRU) provide guidance on the units and measurement techniques used for protection of personnel. One of the most recent reports is ICRP Publication Number 60, 1990, Recommendations of the International Commission on Radiological Protection", ICRP (1990). This report recommends that the "equivalent dose", Ht, equals the absorbed dose, Dt, times a radiation weighting factor, wt. The weighting factor has changed over the years, primarily for neutron radiation for a number of reasons, but primarily because of better knowledge of the effects of that radiation on the health risks that exposure to it engenders. Neutrons of energies between 0.1 and 2 MeV have the highest weighting factor of 20, meaning that neutrons within this energy region are twenty times a damaging per unit absorbed dose as are typical gamma rays or ortho-voltage xrays. These radiations as well as beta rays from radioactive materials are considered to be the least harmful per unit absorbed dose. The variation in weighting factors over the years, as well as the range of weighting factors can produce factors of at least two fold variations in the allowable dose from broad-spectrum neutron sources such as accelerators. Recommendations in ICRU Report 57 (ICRU (1998)) suggest further that the ISO and ROT conversion coefficients be used for environmental dose estimates since they best satisfy the uncertainty about [t]he positions and activities of the general public near high-energy accelerators. Thus conditions of exposure as well as the risks attendant to them have become better defined over the years, allowing for more accurate assessments of neutron and other radiation doses. Operating accelerators produce a variety of radiation fields outside of the biological shielding which is intended to protect personnel from radiation exposures. These are primarily neutrons, gamma rays, muons, and other radiations of which neutrons have the highest intensity, and are the most damaging from a health risk point of view. Personal neutron exposures were monitored as part of the personal dosimetry program at LBNL from ~1959 to the present. During the mid-1980ies it was determined that personal monitoring for neutrons was no longer required for individuals who did not work around the Laboratory's accelerators. The Laboratory's environmental monitoring reports were reviewed for periods from 1960 to 1976 (LBNL, 1960 to 1977). During this time the Bevatron accelerated protons and other light ions to energies, which reached 6.2 GeV, the maximum endpoint energy for protons. Neutron production was incidental to the acceleration of light ions, and because of their lack of electrical charge, they penetrated the thick concrete shielding to produce exposures in persons both onsite and off-site. In fact, there was no roof shielding during the early period of Bevatron operation. The spectrum of these neutrons was best described by the function 1/E, where E is the neutron energy. Superimposed on this l/E spectrum were the contributions from sky shine and evaporation neutrons from interactions of protons with iron in the magnet structures. One can derive a neutron field through thick shielding for a proton beam at 6.4 GeV such that the neutron spectrum would extend from "thermal" energies (average of 2.5 E-8 MeV) to 6.4 E3 MeV. From the Olympus Gate monitoring station the Bevatron looked like a point source producing a neutron field described by 1/E up to 6.4E3 MeV. "Sky shine" neutrons resulted from high-energy neutrons escaping the shielding in a roughly vertical direction, and interacting with molecules of air, resulting in their being scattered back to the ground at substantially reduced energies (<10 MeV). The sky shine neutron spectrum declined as roughly 1/r from the Bevatron, whereas the direct neutron spectrum declined as 1/r2, where r is the distance from the Bevatron. An early environmental report (1971) contained data that neutron doses exceeded the allowed annual dose prescribed by the Atomic Energy Commission. This limit was 500 mrem/y, while the dose reported at the Olympus Gate was 800 mrem/y. This dose was verified during a meeting with LBNL representatives last year. However, an LBNL report was published soon after that meeting which raised issues regarding conversion of neutron spectra to dose. That report made a credible case for reducing the earlier reported doses by a factor of at least two (2). A description of the rationale used in the report follows. Radiation doses calculated for any of a variety of recipient conditions could vary a great deal. No attempt was made to calculate doses to persons beyond the site boundary, but rather to keep the boundary doses within acceptable limits. The best estimate of the impact of neutrons on the environment is a description of the neutron spectrum as a function of energy (the differential energy spectrum). Issues relating to exposure of persons to that neutron field may have a profound effect on the description of radiation dose and consequent health risk from that exposure. For example, the dose itself can be calculated for persons facing the source (AP), away from the source (PA), laterally from the side of the body (LAT), rotating with respect to the source (ROT), or exposed to an isotropic source (ISO), ICRP (1997) and ICRU (1998). Additionally, shielding maybe provided by a housing structure, for instance. These issues combined with the uncertainty associated with residency times can force a dramatic impact on dose estimates in the public sector. Hence, the decision about minimizing the dose at the site boundary was made. More recently, and likely in response to inquiries made by these authors, R. H. Thomas, et al, published a document, Thomas (2001), which negated the high neutron doses previously mentioned. This was largely due to reinterpretation of neutron fluence-to-dose information at the site boundary. The neutron fluences as functions of neutron energy previously referred to apparently did not result in doses in excess of those required by the (then) AEC for protection of the general public. Also, Donahue et al published in draft a report in which the neuron spectra at the Olympus Gate Environmental Monitoring Station (OGEMS) were mathematically generated by Monte Carlo techniques in a computer. The normalized spectra were then multiplied by the measured spectra at the OGEMS, and these results compared with the high neutron dose reported in the 1972 Environmental Monitoring Report. The result, when the newer technique (ICRU, 1998) was used to estimate doses, verified that the earlier reported dose was a factor of 2 too high (Donahue, 2000). The complexity of the Bevatron prevented a completely independent estimate of environmental dose using the Donohue technique. As noted above, the originally reported exposures were in excess of the dose limit of 500 mrem per year set in AEC Manual Chapter 0524, dated February 1, 1958. It appears that LBNL was subject to AEC Manual Chapter 0524 regulations since the laboratory was an AEC contractor. The Manual chapter 0524-02 paragraph 2 states that existing facilities can apply for a conversion period not to exceed five years if a request is made by an appropriate AEC official. IFEU has asked the LBNL to supply a written copy of the request if it was made at the timely response to this request, LBNL has provided documentation from 1958 and 1959 demonstrating than Berkeley Lab developed shielding plans for the Bevatron to meet the new limits. Whether or not this provides evidence of an application in agreement with the provisions set in manual chapter 0524-02 paragraph 2 states appears to be a legal question that IFEU has been unable to resolve. In addition to the above, the issue of relative biological effectiveness (RBE) of neutron radiation has been evaluated by various researchers in cytogenetic experiments. For example, human lymphocytes were exposed to a mixture of neutron and gamma radiation and the increase of dicentric chromosome aberration in cultured cells was determined (Heimers, 1999). Heimers concludes that "[t]he high RBE values of 96 and 113 respectively found in the present study indicate that the weighting factors for neutrons recommended by ICRP 60 (1990) are probably not conservative. Occupational exposure to neutrons may be more harmful than comparatively low values of physical measurements suggest". It is recommended that the validity and relevance of this finding should be assessed in the review of neutron exposures from LBNL. Neutron and gamma doses at various locations at the LBNL site boundary were substantially larger than today. Based on available data, maximum exposures have exceeded 500 mrem/yr using the historical conversion factors. Using current conversion factors for neutron doses, cumulative dose rates at the Olympus Gate station were greater than 2,000 mrem. It is recommended to estimate doses to the nearest residents including the contribution of all LBNL sources and pathways while taking uncertainties in monitoring data, conversion factors and other parameters into account. A recent paper (Heimers, 1999) presents cytogenetic data that suggests that neutron radiation may have a higher relative biological effectiveness (RBE) than is reflected in currently used radiation weighting factors. This paper and other data on the RBE of neutrons should be reviewed further. D.1 What is the potential health risk from past exposures? The calculated dose for continued residence at the Olympus Gate stations as estimated from data in Thomas et at. (2000) was about 2 rem CEDE. Doses for real individuals were smaller than 2 rem because a 100% residency at the Olympus Gate was hardly realistic. On the other hand, the uncertainty in the underlying raw data and the contribution from other radionuclides should be properly evaluated before accepting the Olympus Gate data by Thomas as an upper limit estimate for all residents near the LBNL site. Compared to other sites, doses in the LBNL vicinity are considered to be significant as the comparison of selected data in Table 7 shows. The comparison is difficult since the methodology of dose calculations and the selected scenarios are not identical. Despite these limitations, the data indicates that considerable attention has focused on the reconstruction of radiation doses at sites where exposures were similar to those at LBNL. While doses at the Hanford and Fernald sites were larger than those at LBNL, doses from releases at Rocky Flats Plant, Colorado were comparable or less. Radiation doses from past operations at LBNL were comparable to those at locations where considerable efforts were undertaken to reconstruct exposures to members of the public. In light of uncertainties regarding the magnitude and relative biological effectiveness of neutron exposures and the contribution from other radionuclides and non-radioactive pollutants, an indepth review is recommended. A prerequisite for the risk assessment process involves dose reconstructions for past LBNL operations.